Corporate events come in all shapes and sizes. From massive consumer conventions to company-wide summits to intimate lecture series’, we’ve produced multipurpose corporate event video that we’ve been proud to show off to all involved. As video producers, corporate events are always a thrill to cover. Though they may run on tight schedules, no two events are ever the same. So it requires a skilled and organized production crew to meet the client’s expanding video needs. In today’s media landscape, we’ve seen firsthand how valuable it is to leverage these events to produce original video content. In a corporate event video package, you’re not simply getting a highlight video, but so much more. A single corporate event can deliver video content that a company can use across platforms to market to, recruit, educate, and attract audiences both internally and externally. To give you a sense of the seemingly endless possibilities of corporate event coverage video, we’ve gathered some examples that we’ve come across in our experience documenting events of all varieties. Most of the events we cover are vibrant, dynamic gatherings featuring participants from all over the world. Capturing that lightning-in-a-bottle energy of an event, through what’s called a sizzle reel, is a hallmark of corporate event video content. Usually running no more than 3 minutes, sizzles act as trailers for the full breadth of our coverage of the day’s action. 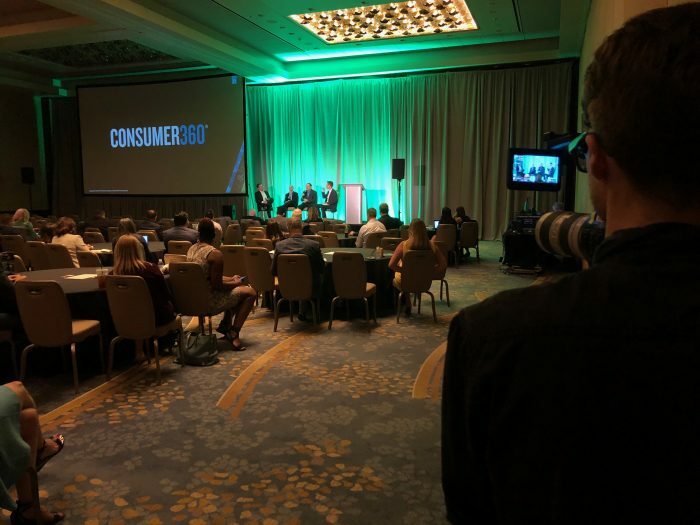 For the last five years, we’ve been filming events for Nielsen Analytics, the largest one being their Consumer 360 conference held every summer. As a 3-day affair, our crew is ensconced in the event’s programming, scheduling out where, when, and what we’ll be shooting. With all of this going on, our team is actively putting together a sizzle reel to be played by event’s end. Throughout all the hustle and bustle, it’s always cool to witness event goers react in real time to the hard work that we’d put in to pull off the reel with such a quick turnaround. Besides just feeding our instant gratification, sizzle reels are a vital tool for the event itself. For one, if an attendee missed day one, they’re brought up-to-date with key faces, names, and sound bites from the previous day. Secondly, the sizzle can function as a brand asset for years to come. Whether it’s being used to promote next year’s conference, or living on the company’s website, the sizzle reel should capture and embody the entertainment quality of the event itself. Having a video crew rolling throughout a lecture series or keynote presentation is a safe way to ensure that some of the most memorable moments of the event have been captured. Oftentimes when covering a convention or larger event, we’ll put several cameras on the speaker, using our footage not just as b-roll for our sizzle, but as a content piece entirely its own. After TED talks became an internet sensation some time in the late-aughts, it became standard for companies to post their internal keynote presentations or lectures as a marketing asset. It’s one thing to have video and audio of the speaker, and it’s another to have high-quality professionally produced corporate event video. A great production will utilize an event’s footage to yield an assortment of video content. So if you’re looking to make the most out of a stirring speech, look no further. A typical raw 45-minute keynote can be cut and repurposed for smaller segments for YouTube and LinkedIn, and even shorter ones for Instagram: a Russian nesting doll of video content, if you will. For the past 3 years, we’ve had the pleasure to cover RSM’s Cultural Diversity & Inclusion events. Representing their 11 different Employee Network Groups, RSM has embraced their employees’ diversity through annual conferences that focus on these groups. In events as employee-focused as these, it’s beneficial to include corporate event video coverage that focuses on the employee experience. They want to show that the event is interactive and not just a series of speakers and panels. RSM implements an experiential marketing component to engage with the attendees. Instead of attracting attendees via a traditional booth, RSM sets up a pre-lit stage with a backdrop of company wallpaper. They draw in attendees with prize incentives in exchange for a quick, fun interview. It’s a playful opportunity to shine a light on the personalities that make such events special. Corporate event videos like these generally find their home on social media, and are especially effective when it comes to recruiting. The sound bites are a perfect blend of spontaneous and honest, and when all is said and done, they speak to the core of what the event is all about. Conferences and corporate events present unique opportunities with most of the company’s leadership team being in the same place at the same time. Fortunately, we’re there to capture personnel interviews that can be repurposed for a myriad of different mediums. 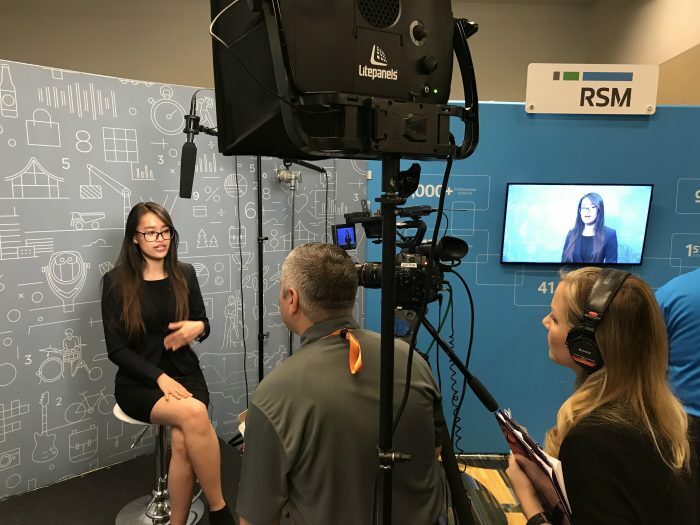 While at Nielsen’s C360 conference, we held private interviews with several leaders from their C-suite while getting sound bites that could be used across functions. Interviews with live audiences are great for marketing purposes. Having one-on-one interviews with their big players on hand is something every company should have in mind, especially when the time comes for a company testimonial. When a conference isn’t entirely called for, smaller events are still fantastic ways for companies to get people excited about something they’re working on. Oftentimes, we’ll be called on to cover a learning experience or discussion series that takes place over one afternoon or evening. Recently, we met up with Tapestry (parent company of Coach) for a lecture series they hosted in front of a live audience. Though it might not be as expansive as a conference video, the corporate event video content from this event can still be used for a lot of different purposes. Small panel series’ are also cool ways for companies to position themselves as thought leaders as promote their business across different industries. Whether it’s an evening guest lecture or a three-day convention, events can really pop with a tasteful video. Beyond the event itself, the corporate event video lasts forever as a testament to the hard work that went into bringing hundreds and thousands of people under the same roof to share ideas and learn from others’ experiences. The current internet landscape demands lots of video content. A great corporate event video can keep pumping out that content until it’s time for next year’s event.